For years now I have advocated that those interested in hoplite combat should make greater use of reenactors who put a great deal of time and money into acquiring an authentic hoplite panoply. Many groups of reenactors exist all over the globe, and I know memeber of many of them. In discussing various hoplte topics with them, one thing is clear: if you ask any two reenactors the way hoplites did something, you'll get three opinions. The fundamental problem is that all the conclusions they draw are based on anectdotal evidence. This does not make any of them wrong, even when they disagree, but the lack of standardization makes comparing between them almost impossible. Often we can't know exaclty why they had different experiences. It has long been a goal of mine to assist groups of reenactors in generating quantitative data on various aspects of hoplite combat. This would be hard data, numbers that we could crunch to provide a true comparison between individuals and between hoplite reenactment groups. There are many elements of hoplite combat that need to be tested, but my main concern is the safety of reenactors, thus no othismos for the time being. I've attached an image that could serve as a first attempt at a standardized test for hoplite groups. This set-up is a basic stabbing test. The data will give us a rate of striking for a hoplite in formation. I think this rate can be fairly well correlated to the offensive potential of hoplites engaged in doratismos. By altering the size of the target and requiring more accuracy, we can simulate strikes that would "kill" or wound. 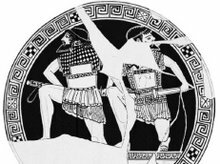 Because we are simulating group combat, at least three men side by side are needed to create a hoplite bounded on both flanks by other men. For our purposes only the central hoplite can be have his strike number recorded, for only he in flanked by others. Here is a second simple test. This one is to quantify the loss of cohesion that we all know occurs as a phalanx advances rapidly in close order. 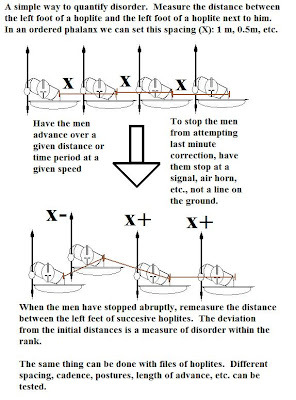 You simply measure the distance between a point on any adjacent hoplites in rank or file- I suggest the left foot. Then you have the formation advance at whatever speed and in whatever formation you wish to test. The men are made to stop at some signal, a horn or simple shout is preferable to a demarkation so that it is harder to predict. Then you simply remeasure the distances between hoplites. The deviation between each pair from their original spacing is a measure of a loss of order. From there you can ask if they became tighter or looser. 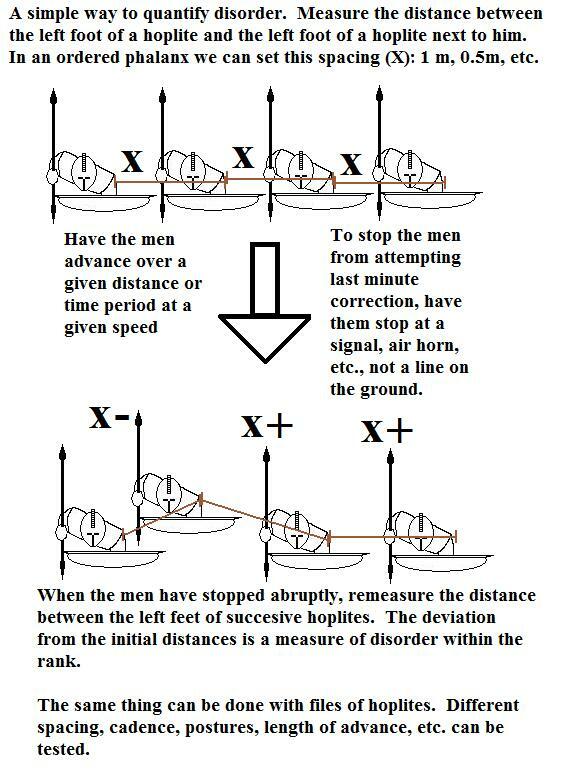 The test can be repeated varying the with different starting formations, individual advancing posture, distance, and speed of advance, etc. I've got a few groups signed on for some testing and welcome any who seek to join. Whatever we are able to do I will run appropriate statistics on and we'll try to publish someplace so that we can all refer to it. Obviously a large number of individuals being tested is good to control for variation between hoplites, but I'd like to get multiple groups involved as well if possible. I welcome discussion on this experiment and hopefully we can plan other experiments as well.